A must do when in Venice is a visit to the famous Harry’s Bar. The ironic thing is that most people end up walking past this iconic bar as it looks so discreet and unassuming from the outside. There is no flashy sign and no symbols that usually mark a famous bar – just the word ‘Harry’s’ stylishly etched on the frosted glass doors. Stepping in Harry’s Bar, located just off Piazza San Marco, really is like stepping back in time. The bar remains true to its history and is decorated with dark wood panelling, old and comfy leather seats and traditional oil paintings. When you first walk through the doors it seems very dated and old-fashioned, but we quickly fell for its charm. In a world where it seems like every bar wants to be modern and artesian or win the award for ‘Most Innovative’, Harry’s Bar sticks with what has successfully worked for over eight decades. ‘If these walls could talk’ is a phrase that could have been written about this place. The famous Venetian bar first opened its doors in 1931 and ever since has been welcoming famous actors, writers, artists, celebrities and high society to wine and dine and escape the bustle of the Venice alleys. Orson Wells, Charlie Chaplin, Maria Callas, Aristotle Onassis, Truman Capote, Nicole Kidman and George Clooney are just some of the famous patrons of Harry’s Bar and the atmosphere still allows you to imagine Ernest Hemmingway nursing his drink in the corner of the room. 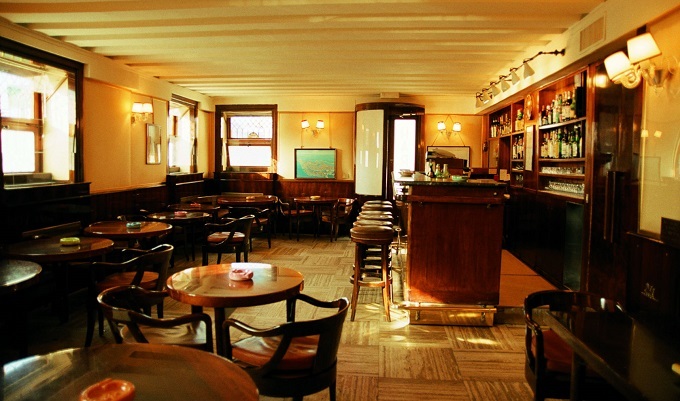 In 2001, the Italian Ministry for Cultural Affairs declared the bar a national landmark, but Harry’s Bar isn’t just a museum-like place to visit. It is also a great place for a drink or a light lunch. While there is a wide menu on offer, for TLTB there was only every going to be one drink to order while at Harry’s Bar. 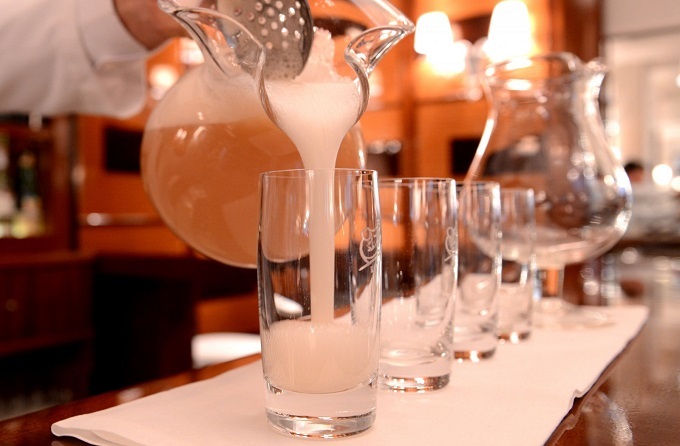 The Bellini cocktail was invented at Harry’s Bar, and they still serve them made to the original recipe. The cocktail of fresh peach puree mixed with Prosecco and served in beautiful stemless flutes really are delicious. Accompanied by a bowl of juicy olives, the cocktails are expensive at €21 per glass, but for the overall experience, and a chance to sit and relax after a day of sightseeing, they are well worth the price. For such a famous and iconic location, it of course attracts tourists from all over the globe. Yet the discreet and dedicated service from the bar staff means you’ll feel as welcomed and relaxed as one of the regulars. Great service, great style and great food and drink… sometimes you can’t improve on perfection, I guess that’s why Harry’s Bar has never tried to change its winning formula.